Braemar House (built 1880) B&B and YHA Hostel is a restored historic homestead located on the banks of the Whanganui River. We have FREE unlimited high-speed wifi and provide a wide range of accommodation options to suit all budgets including Deluxe Private Rooms in our historic Bed and Breakfast wing, great value private Family/Group, Double or Twin Cabin options, or an affordable bunk-bed in our shared Hostel Dorms. 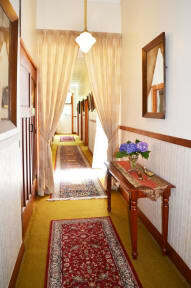 Our B&B wing has 7 unique private rooms with a range of double and twin options, some rooms with garden views and some with access to the front veranda where you can enjoy a good book or morning coffee. Bathrooms are shared in this wing but with three toilets, two showers and a bath there are plenty of options even if you decide to book the whole wing for a group. 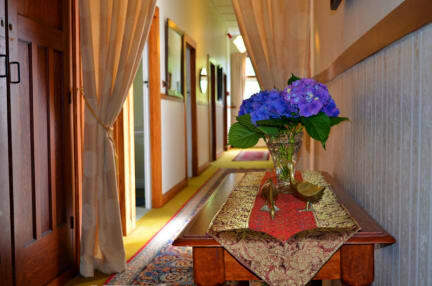 The B&B wing also has its own private lounge and dining room for you to enjoy. Our private Cabins and hostel Dorm rooms (YHA) are spotlessly clean, as is our hostel lounge and adjoining communal hostel kitchen with plenty of space and equipment to prepare your meals and space for food storage. In season you can pick a variety of fresh fruits such as delicious grapefruit from the trees and you may also have some extra vegetables from our excellent vegetable garden. We have a very comfortable laid back hostel and if you want to unwind, totally relax, sunbathe in the garden, grab a book from our library or book swap shelf, or watch TV and feel at home, then this is the place for you. We are just a five minute walk to plenty of tourist attractions and great restaurants and cafes and 10 minute walk from the main street, Victoria Avenue. We are centrally heated in winter and free parking is available in the wide street, directly in front of Braemar House. We have in house access to Hostel International/YHA forward booking facilities and YHA travel desk. The Paddle Steamer Waimarie passes daily in front of the Hostel in Summer, while the famous Mail Run Tours pick up daily from the Hostel. The Volcanic Plateau and Skifields (Turoa) are approximately 1-1/2 hours driving from Wanganui.